The Tel Aviv of these paintings represents both the dreams and the accomplishments of the early founders of the city, and according to Herzl’s predictions that Israel would want to be a normal country, no different than any other. But according to Sali Ariel, we are a city different from any other. Sali Ariel fell in love with the Bauhaus White City of Tel Aviv. This has become her obsession since 2002. Her paintings emphasize the light and colors and the organic roundness of the streets and the buildings. 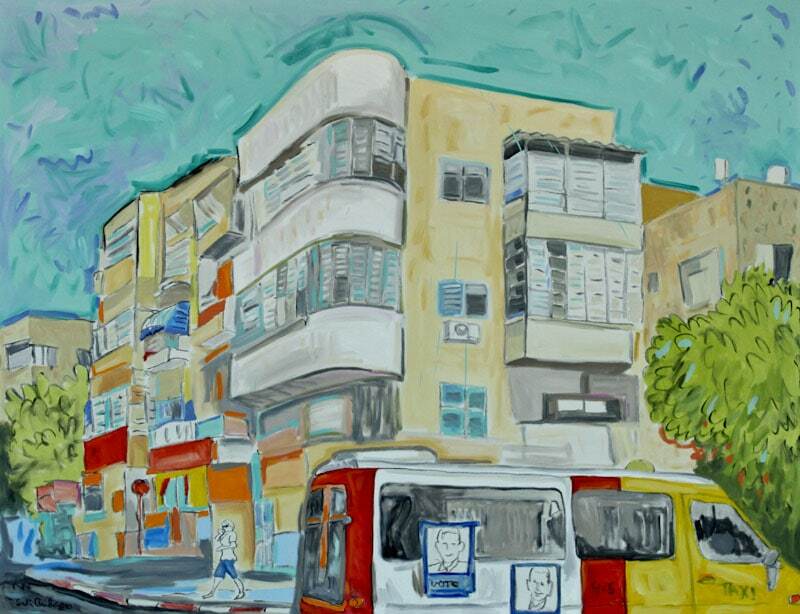 Most of the street scenes and buildings she paints depict the classic Bauhaus architecture of Tel Aviv. Her paintings represent the joy of life in Tel Aviv, the city that we are determined to live in, rather than a city under attack. But we all now know that Tel Aviv, alive and hopeful and always ready to party, is within range of rockets and missiles. Sali’s studio is in a city bomb shelter. On the first day of the recent Gaza war, at midnight, Sali got a phone call that she had to move all her paintings and equipment out of her studio and turn it back into a bomb shelter by the next morning. She, like many other other artists in Tel Aviv use municipal bomb shelters as studios. Then, less than two weeks later, she got a call, to reclaim it as a studio and move all her things back. To Sali Ariel, this is symbolic of the dual nature of Tel Aviv, beautiful, watchful, patriotic and giving the finger to troubles. Ariel’s Tel Aviv has a magic all its own. Sali Ariel, American/Israeli artist, was born in Ft. Smith Arkansas, and raised mostly in Oklahoma U.S.A., where aside from her art; she raised and trained horses and dogs. She studied art at Washington University in St. Louis, Missouri, but left when she and her soon-to-be first husband came to Israel following the Six Day War. After some bumpy experiences in Israel, the couple moved to New York, where Ariel studied art at Cooper Union and hung out regularly with Bob Dylan and occasionally with Andy Warhol, Claes Oldenburg, John Lennon and Yoko Ono and The Grateful Dead. She has lived and painted in Israel since 1972. She lived in Jerusalem for 20 years. Part of that time included 3 years at Shaar Hagai in the Jerusalem hills on a dog farm where she and 4 other women raised and boarded and trained 100 dogs. Her paintings then were in black and white and silver, as she had no electricity and painted at night by kerosene lantern. She has kept her love of sometimes using silver paint, even in the recent Tel Aviv works. The artist moved to Tel Aviv with her current husband, `Dry Bones’ cartoonist Yaakov Kirschen, in 1992. In Tel Aviv she works in a studio rented to her by the Tel Aviv municipality which is in a bomb shelter in Meir Park on King George Street next to the dog playground. Dogs, domestic dogs, seem to naturally pop up in many of her paintings. She paints with a combination of both oil paint thinned with turpentine, and much thicker oil paint and sensual brush strokes. The oil paint is often drawn over with charcoal scratched into the wet paint, which sets the charcoal. This technique lets one feel the loose drawing that is underneath the works. The lines are exuberant and free. The paintings could almost be described as colored sketches in paint. The paintings are figurative, yet modern and contemporary in feeling, and show a sense of color influenced by both the Mediterranean light and her American, “Pop Art” background. The straight lines of the buildings all have a slightly rounded organic look to them. Through the eyes of the painter we see the city as a living breathing organism, as part of nature. Ariel was trained as an abstract colorist, which accounts for the uniqueness of these works. 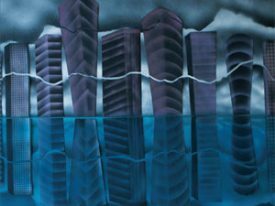 Her “cityscapes” can be seen as frameworks upon which the abstract artist drapes color and the exciting shape interplay of non-figurative paintings. Her powerful pastel-colored palette speaks in many subtle ways. The painter demonstrates the confidence and strength to defy political correctness and narrow trends. She has been brave enough to provide us with works which are fresh, modern, and charming. Internationally she has exhibited in the USA, and, in Germany, Italy, and most recently, in Singapore and Zurich. Her oil paintings are in many private collections around the world, and many of the foreign Diplomats who have served in Israel have collected her paintings and taken them to their next postings and to their home countries. Ariel reports that one of her Tel Aviv street scenes was hanging in Saudi Arabia in the bedroom of the residence of a former British ambassador to Israel. Her work is in collections in the USA, Canada, Japan, England, Germany, Austria, Spain, South Africa, Cameroon, Nigeria, and Turkey. Ariel has exhibited in Tel Aviv galleries, including solo shows at the Horace Richter Gallery and the Tel Aviv Painters and Sculptors Association, and 3 solo exhibits at the Bauhaus Center. When Ariel is not painting, she devotes much of her time to her voluntary activities with the International Women’s Club, where she served a few years ago as president. She also is a volunteer art teacher to the Diplomatic Spouses Club.